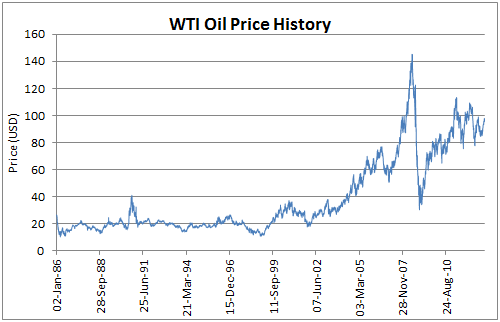 These two Excel spreadsheets automatically download historical crude oil prices straight into Excel. Both tools are fully automated; the most you do is supply dates and click a button. Some VBA then downloads the data from a 3rd party website, straight into Excel. 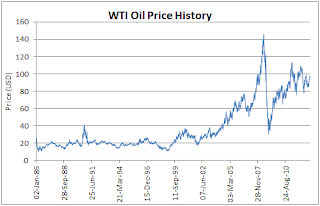 After the data is in Excel, you can do whatever you want - visualize price historical, perform economic analysis, correlate oil prices against the cost of other raw materials, and more. The first spreadsheet downloads Brent oil price data, while the second downloads historical prices for West Texas Intermediate . The price of crude oil effects the price of everything we use or consume, including food, fertilizers, gasoline and household electronics. It also influences the price of other industrial chemicals, and accordingly is a major economic factor in the chemical and process industries.